Dr. Abdul Salam joined the University of Punjab in Feb- ruary 2017, as Professor of Economics. His appointment has been made by the State Bank of Pakistan, through open competition, against Abdul Qadir Memorial Chair established by the Bank at the Punjab University. Dr. Abdul Salam earned his Ph. D. in agricultural econom- ics from the University of Hawaii, USA, in 1975. Before joining the University of Hawaii, on an East West Centre Scholarship, in 1970, Dr. Salam studied at the University of Agriculture, Faisalabad and earned his MSc (Hons) in agricultural Economics. 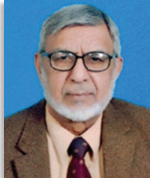 Starting his professional career at the East West Centre’s Food Institute as a Research Associate on a short time assign- ment in April 1975, he joined the Pakistan Institute of Development Economics in August 1975 as a Research Economist. In 1982, Dr. Abdul Salam was selected by the Agricultural Prices Commission, to serve as Chief, Farm Production Economics Division. Te government of Pakistan appointed him as Member Economics in the Commission in 1993 and Chairman of the Commission in 2002. He has served on several expert committees and working groups appointed by the Government. In 2006, Dr. Salam joined the Federal Urdu University of Arts, Science and Technology, Islamabad as a professor of economics and also served as chairman of the Depart- ment of Economics from June 2012 to May 2016. At the Federal Urdu University, he taught graduate classes courses on development economics, food and agricultur-al policy, research methods, international trade, macroeconomics and supervised thesis research of graduate students. He has also served as a visiting faculty at the NUST and International Islamic University, Islamabad. He has published extensively on issues relating to farm production and productivity, technology adoption, farm mechanization, terms of trade for agriculture, agricultural policy and poverty, dis- tortions to incentives in farm production, food security. He has refereed papers for several journals, evaluated M.Phil. and Ph.D. theses of several students, and worked as a consultant with the World Bank, International Food Policy Research Institute (IFPRI), Asian Development Bank and Food and Agriculture Organization of the United Nations. He is alumni of the East west Centre and Hewlett Fellow of the In- ternational Agricultural Trade Research Consortium.